Bread & Jam are a small creative team making fabulous things for your home and to give as gifts to your friends… and loved ones. Their philosophy is simple, take a really great quality basic and sweeten it up using their own printed designs. 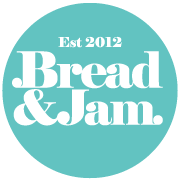 Bread and Jams designs are based upon whimsical notions and phrases and their patterns and designs are heavily influenced by Mid Century design, notably original ceramic, glass and fabric patterns.